Advances in dental technology improve our ability to provide truly digital dentistry. One example is with digital x-rays in Medford. Radiography has long been an invaluable tool for preventive dental care, and digital x-rays make the process better than ever before. These images are captured efficiently and are ready almost instantly to reduce appointment times. Digital x-rays are improving our ability to provide early detection of cavities, faulty dental restorations, extra teeth beneath the gum line, the presence of wisdom teeth, and more. Read on to learn more about the technology, then schedule an appointment with the modern dentist at Island Daily Dental Care, Dr. Gary Rosenfeld. We recommend that children and adults alike undergo a set of digital x-rays usually once a year. Having x-rays taken is the best way to avoid the need for complex restorative care later on, as we are better able to detect issues sooner to provide the most conservative treatment possible. 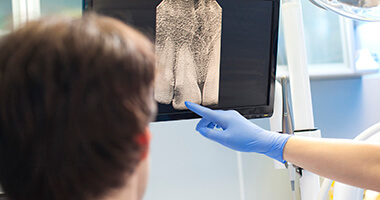 X-ray technology allows us to see what is going on below the visible surface of your tooth enamel, like cavities between teeth, leaking fillings, and extra teeth beneath the gum line. When we take a teenager’s x-rays, we will also look out for the presence of wisdom teeth to see if early intervention can help to prevent future problems. Some patients fear the risk of radiation exposure with x-rays, but digital x-rays greatly reduce the amount of radiation exposure — by as much as 85% compared to the traditional method. The amount of radiation associated with x-rays is negligible considering the significant benefits of preventive dentistry with x-ray images. Unlike those captured the traditional way, digital x-rays are ready instantly. Dr. Rosenfeld will carefully examine the images for evidence of oral health hazards. Digital x-rays are easily enlarged to get an up close and personal view. If your treatment case requires a specialist’s attention, the digital x-rays are easily transferred between offices to make it easier for Dr. Rosenfeld to partner and communicate with the best specialists in the area. Your dentist in Medford is happy to be increasing our digital dentistry offerings with digital x-rays. Choose the dental practice that offers state-of-the-art technology in a comfortable environment — you’re welcome here at Island Daily Dental Care! Contact us to schedule an appointment today.